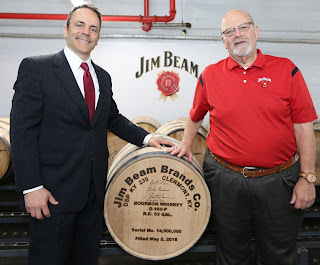 Kentucky Governor Matt Bevin and Beam Master Distiller Fred Noe fondle barrel number 14,000,000. Jim Beam (Beam Suntory) filled its 14 millionth barrel today. That is 14 million barrels (53 gallons each) since the distillery reopened after Prohibition. Put another way, it is 14 million barrels in 83 years. That averages out to 168,675 barrels per year, but it has been just two years since barrel number 13 million was filled, so the current rate is 500,000 barrels a year. That is the key information to take from this milestone. Not only is bourbon booming today, this means the major producers believe it will continue booming for many years to come. Million-barrel milestones are a traditional photo opportunity for Kentucky's biggest distilleries. Today Matt Bevin, Kentucky's new governor, joined the festivities at Beam's Clermont distillery in Bullitt County. For the milestone, Beam counts barrels filled there and at the Booker Noe Distillery in Nelson County. It does not count barrels produced at Beam Suntory's Maker's Mark Distillery in Marion County. "Kentucky bourbon has become not only an American icon, but an international symbol of our proud heritage and craftsmanship," said Governor Bevin. "I'm pleased to toast Jim Beam's impressive milestone, rich history and spirited future." Kentucky's whiskey-makers did well during the eight years Steve Beshear was governor. Eric Gregory, president of the Kentucky Distillers Association, took office shortly after Beshear did, so he has never worked with any other governor. Bevin, a Republican, succeeded Beshear, a Democrat, who had succeeded a Republican, Ernie Fletcher, but the current productive partnership between the state and one of its signature industries mostly developed under Beshear. Bourbon is crucial to Kentucky's economy, in terms of whiskey production and its associated industries (e.g., cooperage), as well as its contribution to tourism (Kentucky's third largest industry). According to the Kentucky Distillers' Association, bourbon is now a $3 billion industry in the state, providing more than 15,000 jobs and generating more than $166 million in tax revenues annually. Over the past five years, the bourbon industry has grown 35 percent. Over the next five years, Beam Suntory alone plans to invest more than $1 billion to make bourbon in the Commonwealth. Virtually all of the growth in bourbon production, distillery expansion, new distillery development, and bourbon tourism occurred during the Beshear administration. He showed up at just about every event, to welcome new distilleries to the Kentucky Bourbon Trail, to honor Master Distillers, and to commemorate industry milestones. It was something Kentuckians and industry watchers had never seen before, their governor arm-in-arm with the commonwealth's whiskey interests. Many Kentucky producers, large and small, and many others involved with the industry held their breath when the administrations turned over this past December. Bevin ran as a pro-business conservative, but also as a social conservative. Many of his supporters are rabidly against alcohol consumption in any form. Bevin was also a wild card because he had never held elective office before. It was impossible to know for sure if there would be any change in Frankfort for the whiskey industry. Bevin also attended today's groundbreaking for the new Luxco Distillery just outside of Bardstown. So it is good, reassuring, to see Governor Bevin at a distillery, pounding in a bung, and smiling for pictures with his hand on a whiskey barrel. We hope he will be supportive in more tangible ways too. Nice article, Chuck. But, "fondle"? Gov. Beshear suceeded Ernie Fletcher. Thanks for the catch. My bad. Ernie Hawkins is a blues guitarist who no doubt would have been a fine governor. It's alright Chuck. We try to forget Ernie Fletcher too! His sucessor was a great improvement. Thanks for sharing the news about my great home with those folks not lucky enough to call Kentucky home. If Chicago ever gets to be too much just come on back. I think about it all the time but I'm devoted to inertia. <>This is dead-on right, and something that I, a Kentuckian, didn't really consider. Thanks for pointing that out. And if Bevin's actions so far are any indication of the new governor's support of bourbon, I'd say he's picking up where his predecessor left off.